One of the most commonly used plants for garnishing is parsley. However, this plant is not good only for making your dish look pretty. Parsley contains a compound called myristicin, a compound known to inhibit the growth of stomach and lung tumors. A recent research on laboratory mice has shown that myristicin found in parsley has the ability to reduce the growth of stomach and lung tumor. One of the leading causes of nerve damage is neurotoxicity. Neurotoxicity is a type of brain damage or a damage of the peripheral nervous system, normally caused by man-made toxins, such as pesticides and heavy metals. These toxins damage the function of the nervous system and are even able to disrupt or kills the nerves. As we know, the nerves transmit and process information and signals to the brain and other parts of the nervous system. A study has shown that parsley juice can treat the symptoms of neurotoxicity. As researchers have discovered in a study on mice, parsley juice improved the condition of mice that had been poisoned with cadmium. The leading cause of chronic diseases such as arthritis, osteoarthritis, and gout is inflammation. And guess what, parsley can help with the problem of inflammation too! Parsley is abundant in vitamin C and thus is able to reduce the level of c-reaction protein in the body, a protein known to be an inflammation marker. One of the best ways for you to enjoy the benefits of parsley is to prepare yourself a nice cup of parsley tea. Here is the best recipe for parsley tea you will ever taste! Put the water on heat and wait until it starts boiling. Then, add the parsley into a heatproof pitcher or some other container. Add the water to the pitcher. Let the parsley steep for nearly five minutes, and then strain. 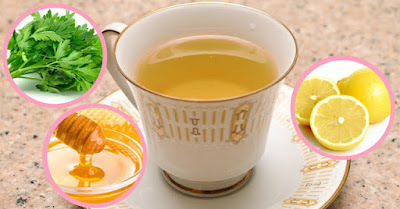 Enjoy your parsley tea and its benefits!